It’s Friday! Time for the possibly-soon-to-be-regular feature Cocktail of the Week! Tonight, a house variation of a very old school cocktail called The Aviation. The combination of gin and cherry brandy or maraschino liquor (no relation to those God-awful bleached-and-died cherry things) is better than it sounds. Our house variation is a bit sweeter, but still a light, balanced cocktail that goes down nicely without being cloying. 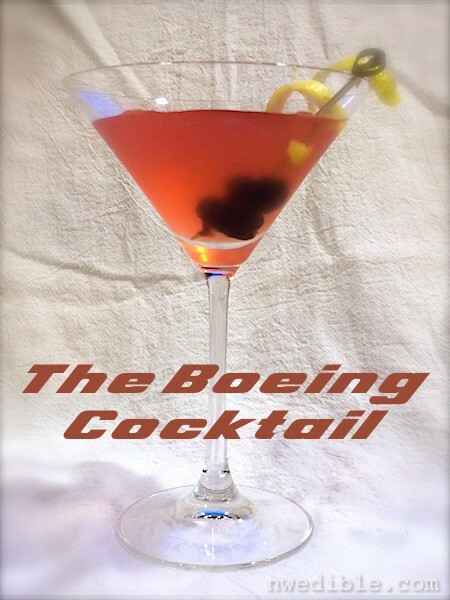 Because we make ours with house-infused Washington-state Bing cherry liquor and Washington-state made gin, we have renamed our Aviation variant The Boeing Cocktail, a nod to the aviation company that resides here, too. 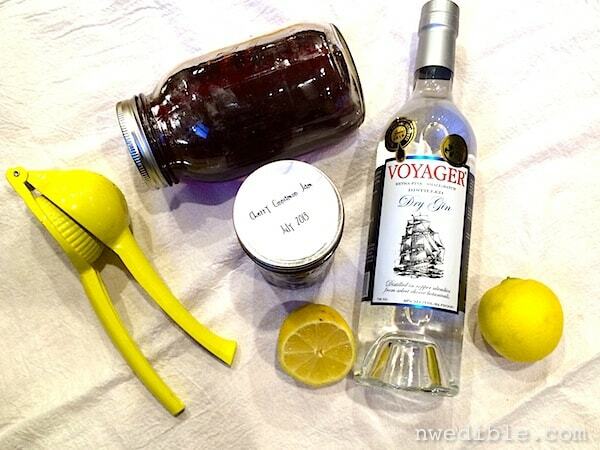 You will need gin, cherry brandy or good cherry liquor (the latter will be sweeter), fresh lemon, and whole cherries in syrup to garnish. 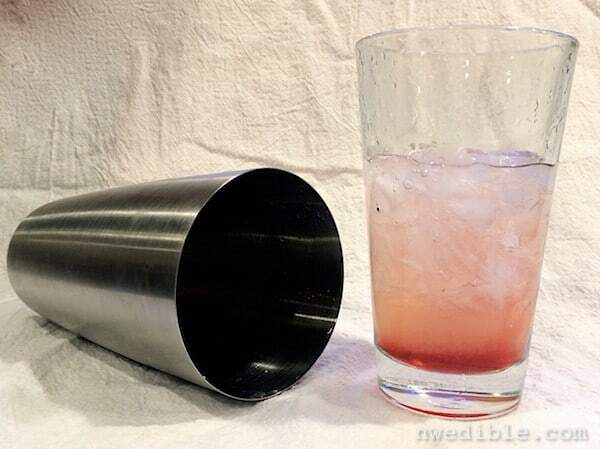 Shake hard with crushed ice and strain into a chilled cocktail glass. 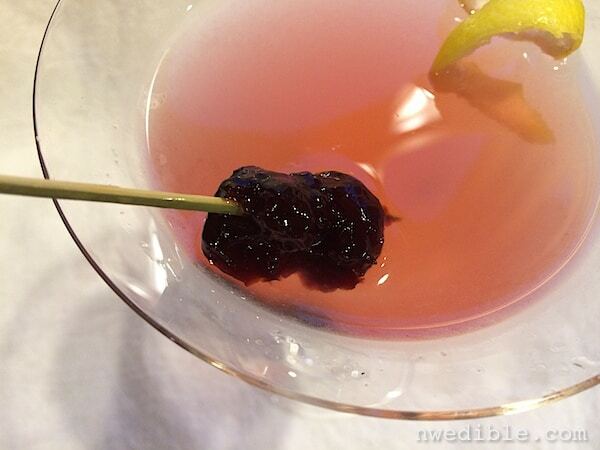 Garnish with a lemon twist and a few whole cherries in syrup to garnish. No bright red “maraschino-flavored” cherries. Ever. Cheers! I am a fan of this new feature. Yum yum yum! Gin is my favorite! Have you tried Aviation gin? My hubs loves it. I prefer a more citrusy gin myself. We have tried Aviation and both like it. I also like Hendricks and Nick is a big fan of Voyager, which we used here. It’s super local and plays very well in cocktails. I think all three are very smooth, balanced gins. Hard to go wrong. Yay for old school cocktailing! I like this drink despite it’s pink-ness, which is always a strike against a cocktail in my book. What maraschino do you use – Luxardo? Maraska? I have three quarts of homemade cherry liquor to use up before I am allowed to buy anything boozy and cherry-flavored but it’d be great to have your opinion if you’ve compared them. If we are trying to use things from Washington state, are we going to drink this while smoking a “fat one”? I love this! We make this same cocktail, but with whiskey! So good!! I have been soaking dried cherries in whiskey too to add! Found your site from pinterest. This drink looks delicious. DH and I like to come up with new drinks to try and this is now on our list. It’s 10:11 am on Wednesday. I’m feeling like maybe I could really use one of these. Like right now. I have some loganberry liqueur from our local Whidbey Island Distillery, though, and I bet it’d be a nice replacement for the cherry. Too bad I have to wait till I get home! Can’t wait to try this tonight, but I am curious: doesn’t an Aviation typically have Creme de Violette? Have you tried adding this to your Boeing adaption?? (I ask because somehow – overly enthusiastic home cocktail experimentation, I think – I ended up with a bottle of this stuff that I need to get rid of, and I don’t much like traditional Aviations, but maybe it would be better with my homemade Michigan sour cherry liquor. Now if you could come up with a drink that uses the homemade rhubarb liquor I made last summer, I’ll be very happy!